Rod Brooks | Seeing the Edge | Blog > Make it a great day! What type of day will you make? Every workday morning I do the same thing. I record a new voice mail greeting that announces the new day of the week, the date, and informs the caller of how and when they are likely to hear back from me. To close, I end each message with one of two phrases. The first is one that I've used for nearly 40 years - "Make it a great day." More recently, I've started sprinkling in a newer version - "Make it a kind day!" Earlier this week, I was thinking about potential topics that I'd like to add to my blog. I realized that recognizing and understanding that my day will be what I make of it has given me an edge in my career and life. I'd decided to tell share the story about the origin of my greeting and was looking through the news feed of my Facebook account when I spotted a post that validated my thought. A good friend, Imelda Dulcich, had posted an upbeat and encouraging welcome to the new day. I responded, and the rest of this blog post seemed to write itself. This is how our short exchange looked on Facebook. Imelda Dulcich PR and Social Media: Set your sites on making it a good, productive day! You can do it. Happy Tuesday. Imelda. Rod Brooks: YES! Ironically, just within the last hour I added "making it a great day" to my mental list of blog topics. When I was in college I told a professor to "have a great day." He stopped me and asked me where and how he could get one. I was stunned. He went on to inform me that a day is what you make it. "Great days are seldom had," he said, "they are made." For the last 40 years I've remembered that all important impromptu college lesson. If you call me and happen to get my voice message you'll hear one of two phrases... "Make it a great day" or "Make it a kind day." I wish you well in making one of each for yourselves today. 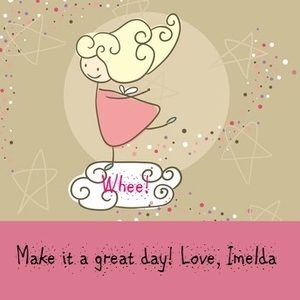 Imelda Dulcich PR and Social Media: I love the idea of making it a kind day Rod. Great thought. And so very true about making it a great day - one has to make conscious choices to do so. It's easy to grumble through the many challenges of a day, it's work when we strive to make it a better day - but the outcome is so much better. It also helps us see little moments of greatness and appreciate them, as opposed to looking only for the most momentous happenings and being disappointed when we don't realize them. Thanks Rod Brooks as always. Thank YOU Imelda. You are a frequent source of inspiration and kindness. Make it a _____ day! How will you fill in the blank? May. 29, 2013 A kind day indeed! That is great!